Spoil your loved one with our Night at the Ball Arrangement. Perfect for the Stiletto lover in your life, this gorgeous arrangement is presented in a high heel shoe. Colour of shoe and flower design will vary. Each shoe is a unique design, our stiletto bases are limited in stock, with only our Red Shoe base or Black Jewel Shoe base currently available. Select which flower colour you would like from our list, or call our friendly qualified florists to discuss your needs (02) 4947 8005. 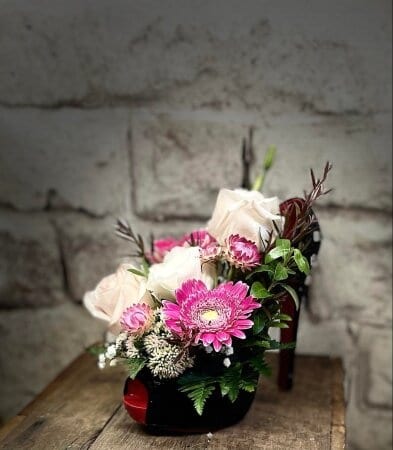 After finishing with your fresh flower arrangement, reuse your floral shoe base as a phone holder, wine bottle holder, or bring it back in for a new arrangement. Get in fast while stock lasts. Night at the Ball Arrangement from Amaranthine Flowers By Design. Your local florist in New Lambton, Newcastle.